A license is required before any Portal will function. A License Request can be generated using InterConnect Server Tools, as described below. Warning: Request a license early in the installation process (immediately after InterConnect Server Tools is installed), as it may take up to a business day before a license is issued. Other components may be installed before licensing is applied. After requesting the license, you may optionally continue with the installation of other components. 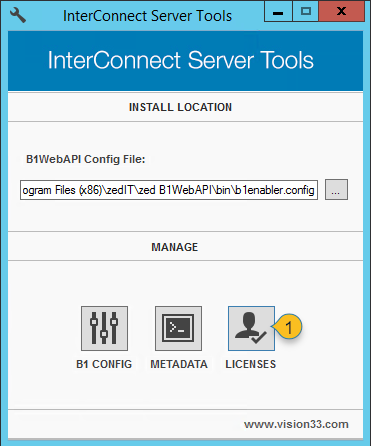 Start Server Tools in Admin mode on the server where B1WebAPI was installed (typically the SAP Business One server). 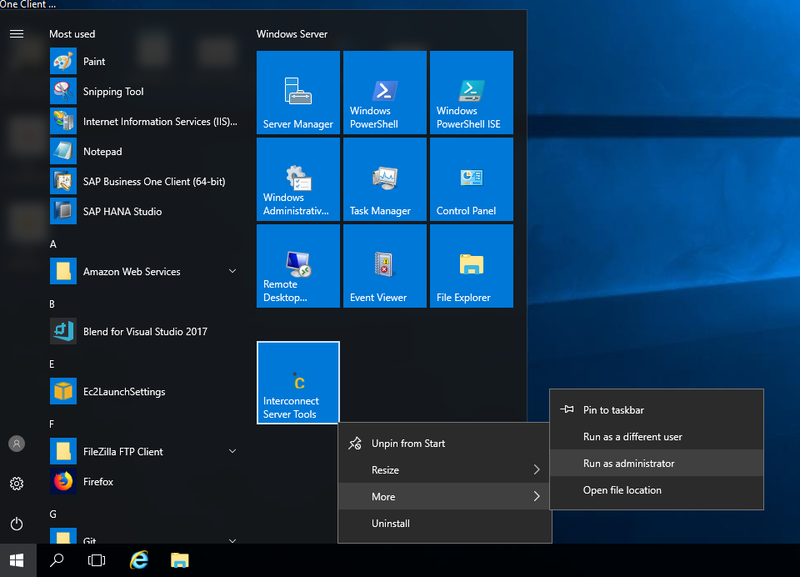 Run Server Tools as Admin from the start menu. Open the license window by pressing the licenses button (marker 1 below). Open the License screen using the Licenses button (1). A notice will be displayed if no licenses are applied, which will be the case for new installations. If this notice is not displayed, that means a license has been applied to at least one product. This notice is displayed for new installs and systems without licenses applied. 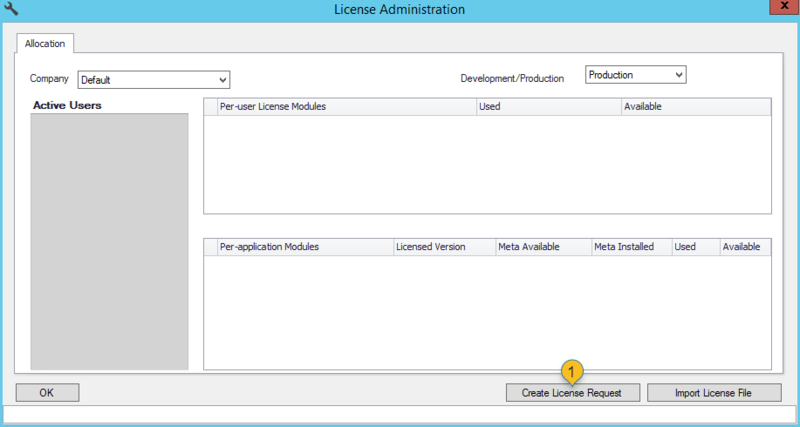 Press the Create License Request button (marker 1 below) if licenses have not yet been applied or if the existing licenses must be updated. Available licenses will be displayed on the License Administration screen. See Requesting a Portal License for more detail. 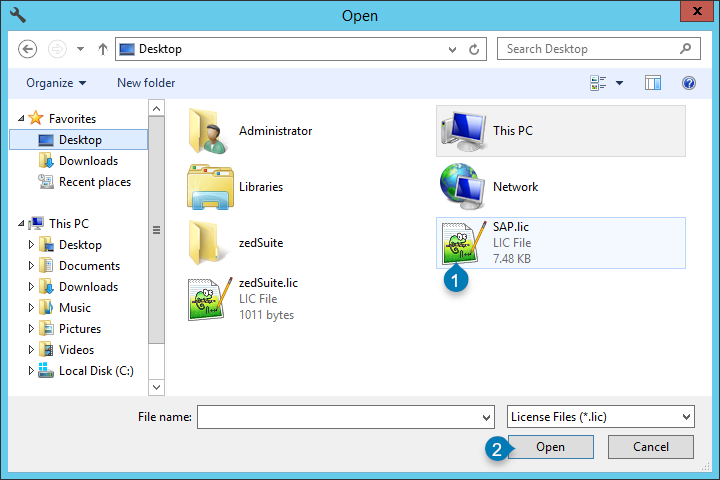 Press the Create License Request button (1) to open the license request form. 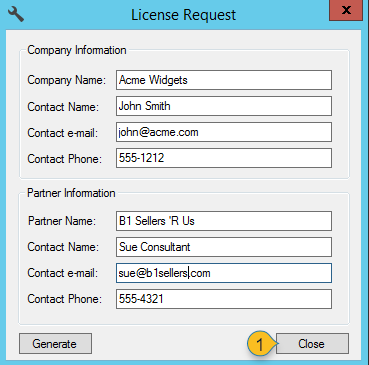 Fill in the contact information and press the generate button (marker 1 below) to create and save a license request file. 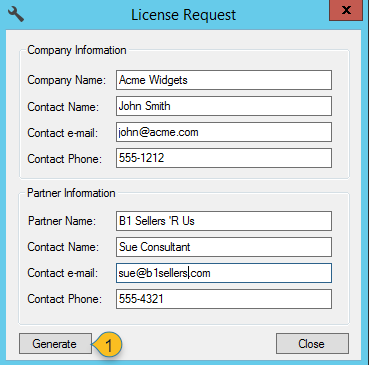 Fill in the details and press the Generate button (1) to create a license request file. 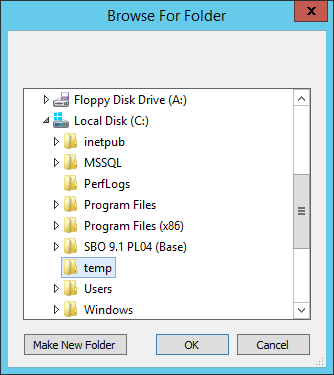 Pick a folder to save the license file. When the license file is saved, press OK to continue. Close (1) the license request form. License File, including customer and partner details. Support will endeavor to create a license within one business day. Send an email to support with the license file, products and version. Unzip, then install the license file provided by Support. This file will typically be the same as your server name. Press the Import License File button and select the license file sent by support. Warning: Installing a license will remove all previously assigned application licenses. Named user licenses will be maintained but application licenses will need to be re-applied. This may trigger metadata updates, which will force B1 users to log out and log back in. Import (1) the license file provided by support. Select the file (1) and press the Open button (2). 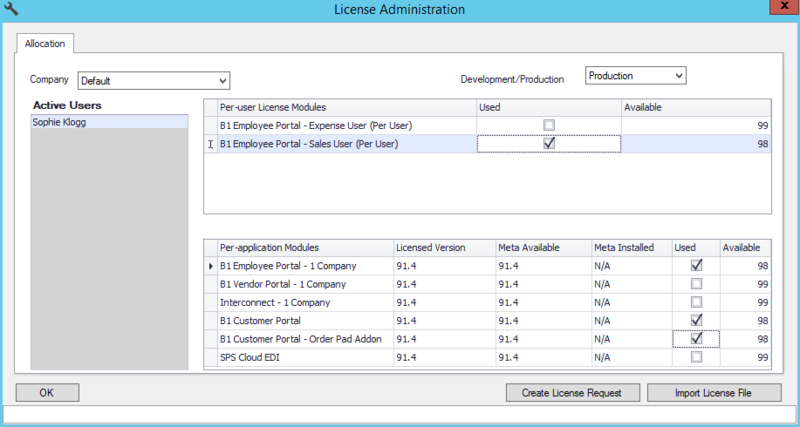 Assign the desired licenses to each company using the Used check-box. Warning: Hana metadata installation can take much longer than SQL. Due to the in-memory nature of Hana databases, metadata can take several minutes to install for each Portal, even up to an hour or so. Allow the system to proceed even if it looks like it's "not responding". For new installs, you can check on the progress in Hana Administration Console by selecting a count of the UDT tables from CUFD. Select the profile (marker 1 below), then assign application licenses (marker 2 below). If prompted, confirm metadata installation prompts to install version-specific metadata. Note that metadata installation will force all B1 users to log out and log back in, so ensure this is scheduled ahead of time to avoid B1 disruptions. Select the profile (1) and enable product licenses (2). 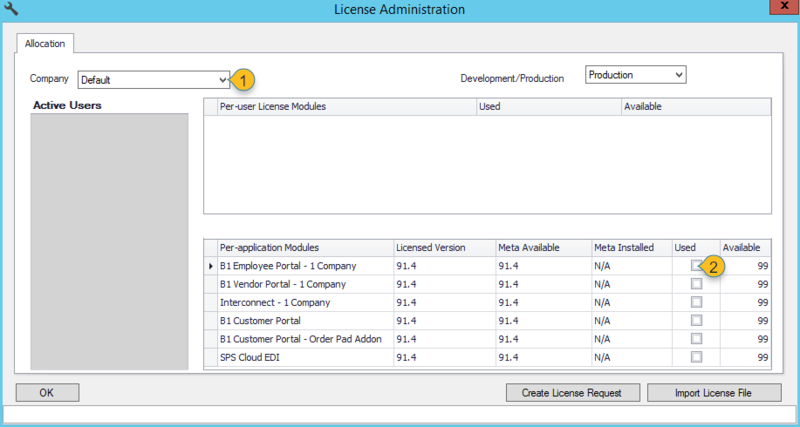 Once the Application license is installed, a user may be configured in B1, then assigned licenses in the named user license section. 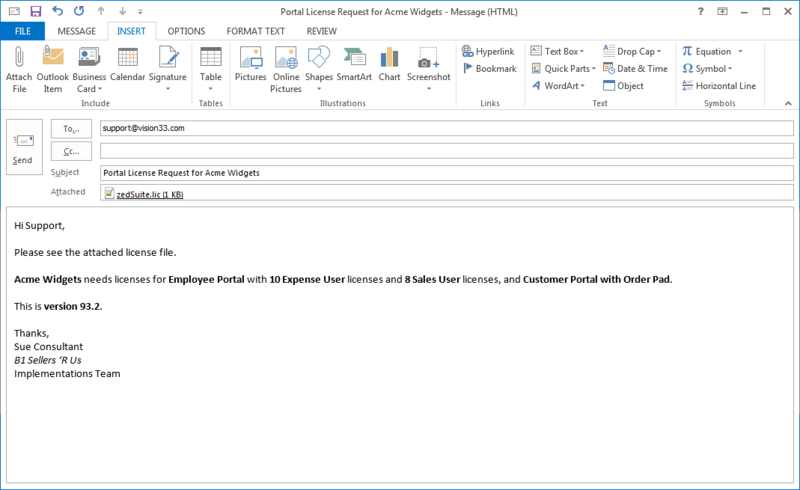 Shown here, Employee Portal, Customer Portal and Customer Portal Order Pad are licensed for version 91.4 with installed meta-data. On Hana only: Manually install Hana functions contained in the install package: /Setup Files/2 - Server Tools/Hana_Install-functions-manually.sql. Using Hana Studio, Open SQL Console for the desired company database, then run the SQL installation scripts in the provided file. This is required for new installations or upgrades from a version prior to 93.1.